Tile throughout Living and Dining room with carpet in bedrooms. Ceramic Tile in Foyer, Kitchen and Baths. Electronics include 41” Flat Screen HDTV, DVD, CD-Stereo in Living Room, 26" TV, DVD in Master Bedroom, 24" TV, DVD in Guest Bedroom. Great knowlgeable team. Very friendly. Really enjoy working with them! Overall great. The furniture in this particular condo was really heavy and not beachy at all. BUT that certainly did not affect our stay at all! Wonderful week! Cant wait to return! We really enjoyed our stay. The condo was clean and very relaxing. The view was beautiful. The beach clean and well maintained, not too crowded to enjoy. We look forward to coming back! Everyone was friendly and helpful. When our initial rental became unavailable we were moved to another unit. It was wonderful. The unit was great. He everything we needed. View was the best. Convenient to Pensacola and anything we needed. 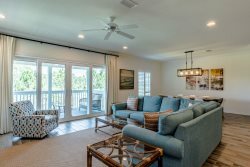 The Perdido Realty team was excellent from start to finish. They were friendly, courteous and knowledgeable. I appreciate the professionalism combined with great customer service. Have had many experiences with this business and have been impressed each time. We reserved online and didn't realize that the room was not sufficient for our family. When we arrived, the staff realized how big our children were and upgraded us to a condo that was sufficient for our family and said they wanted our stay to be pleasant. We didn't ask to be upgraded, but they wanted our stay to be a great experience! Plus, our room was ready for us to check in! That was an extra bonus! The condo was AWESOME and plenty roomy for our family! We had a wonderful time and will be back. We have stayed in another town with another realty company for over 20 years, and they have never been as kind or accommodating as Perdido Realty was on this trip! We have a new place to vacation! Perdido is one of my favorite places to vacation..
Great Beach Decor and comfortable beds!